Thanks for popping by. Our theme today is living a life that is true to ourselves. 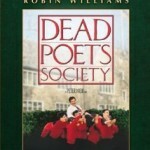 In the inspiring movie “Dead Poets Society”, unconventional English teacher Robin Williams exhorts the schoolboys to “seize the day” before they, like students past, are nothing more than maggot food. To follow their passion, to live in the moment, and to die free of regret. “I have not the heart to sweep away the tinsel that fills my room. In an intimate conversation with her worldly friend Maria, Isobel probes Maria’s affair with her young Italian lover. “That is easy to say, until you lose him,” said Isobel. Isobel fears that, unlike hedonistic Maria, she does not have the courage to live a life true to herself. She fears she is destined to die the cosseted but unfulfilled wife of a workaholic husband. Whether she will or not remains the issue at the heart of the story till the very end. If this post has touched you, please forward to those you care about. Thanks for your time and hope to see you back here soon. I must admit that I regret some of the decisions I've made throughout my life and I can agree with the regrets listed. I also regret that I was never able to overcome my 'growing up years'. My Grandmother is dying as I write and I know she's had a very tough life and no doubt made some decisions in life that she regretted, but let's face it, who hasn't and what's important now, right at the end? Her family and the good times she had.